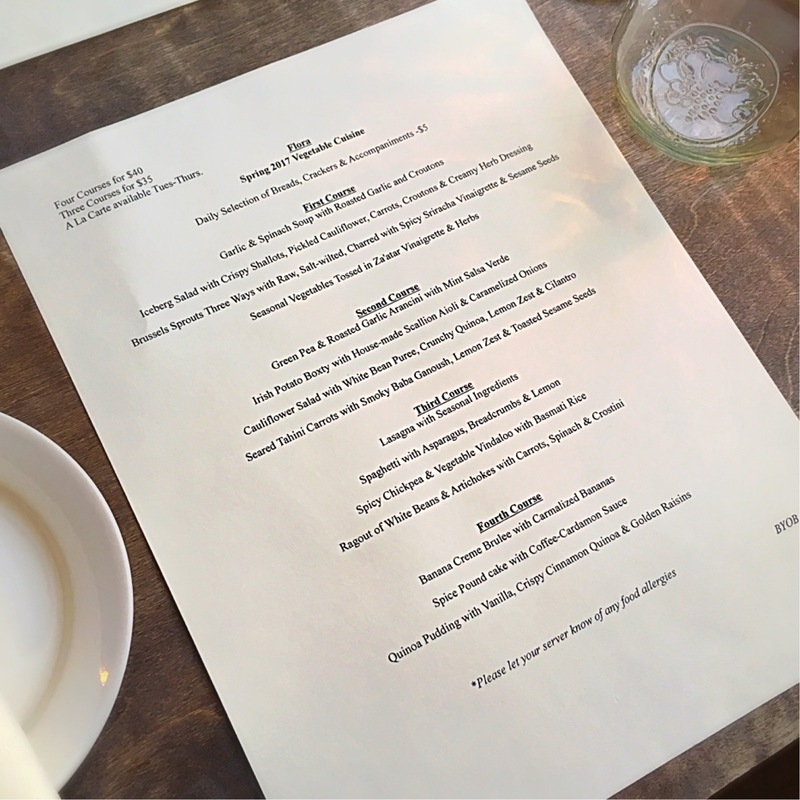 I was recently invited to Flora in Jenkintown, PA, to try out their new spring menu. In case you don’t know, Flora is a 16-seat BYOB vegan spot that opened its doors a little over two years ago. Since this time, they’ve gotten a lot of great press and for good reason. Ant and I, excited that a new vegan place opened up out our way, finally had a chance to dine at Flora last year and loved it. So you can imagine how high we jumped at the chance to go back and taste what they’re offering now. Flora offers a prix fixe menu, where you can pick your 3 courses from their small list of options for $35. It’s $40 if you decide to add dessert and, really, who wouldn’t do this? I don’t want to know those people. The restaurant is represented by Dan Brightcliffe, who I basically consider the “face” of Flora (he appears to run the show, including front of house operations and all social media activity). He also helps chef Eliza Robinson create a new menu each quarter based on what’s fresh that time of year. And just like Philly-favorite Vedge, Flora considers itself a “vegetable restaurant.” Since the menu centers around vegetables (you won’t find seitan or other processed meat substitutes as the star of any dish here), the menu is developed based on what’s in season. Dan says that Flora also tries to use as much local produce as possible. Thinly sliced purple cauliflower, rainbow carrots and radishes were dressed with a unique mix of Middle Eastern spices that I can honestly say I’ve never before tasted but really enjoyed and would love to eat again. And again. Wow, wow and more wow. This was by far our favorite dish of the night: a warm potato pancake topped with fresh scallions and served over aoli, made with a tofu-based mayo they make in house. If I could just eat this dish – and only this dish – for the rest of my life, I might not be too sad about it. Though it wasn’t specified on the menu, this dish came with a heaping helping of cilantro on top – such a divisive herb, that one. I despise cilantro so it truly says a lot that I ate it (Ant, on the other hand, loves it with a passion so he was in pure delight). And once I ate beyond the offensive green stuff, I couldn’t get enough of the warmly spiced chickpeas and fragrant basmati rice. Bananas are another item I can’t stand and Ant loves, but for the sole purpose of reporting I did try a small bite. While I don’t like bananas even slightly, I could appreciate the crispy caramelized shell and the creamy banana pudding. If you do enjoy bananas, you’ll want to try this one for sure. The spice pound cake, served topped with warm coffee-cardamom sauce, was my dessert of choice and it didn’t disappoint. It was just sweet enough without being too sweet, as some desserts tend to be, and would have made the perfect breakfast as a companion to a nice cup of coffee. I’m kicking myself for not getting a piece to go for the next morning. One thing we kept remarking on again and again was just how fresh the flavors were in each item we tasted. It was definitely clear to see why the dishes on the menu were developed to represent spring, with fresh, seasonal flavors in every bite. It’s a small plate restaurant, but while the plates may be small you do leave there very satisfied. The courses are also brought out quickly and with a well-timed delivery; even though Flora was busy the night we visited (every seat was full), we never had to wait too long for the next course to arrive. Flora always offers special deals. Want to save a little money? Check out their ongoing promotions, including free dessert for Keswick Theatre patrons the night of the performance and weeknight discounted dinners if you’re coming from or going to the Hiway Theater right down the street. Plus, I’ve seen Dan post occasional deals in local vegan social media groups, so keep your eyes open for those as well. I’m going back to try the chef’s tasting menu for sure. And in case you are interested as well, this option sounds incredible: contact Flora at least one week in advance, inform them of any allergies or dietary preferences and let them create a menu specially designed for you and your dining companion. You’ll be presented with a unique 7-course menu for $70 per person. It’s certainly not an every day sort of meal, and right now it’s only available to parties of two, but it definitely sounds perfect for that occasion you’ve been meaning to celebrate with someone special. They’re located at 307 York Road in Jenkintown, PA and are open Tuesday through Saturday nights. Parking is available in metered lots behind the restaurant, and reservations are strongly recommended. Follow them on Facebook and Instagram to not only view gorgeous photos of more of their wonderful food but also to keep up to date on those occasional social media specials I mentioned above. If you’re going, let Dan know I sent you (and please have a boxty for me)!